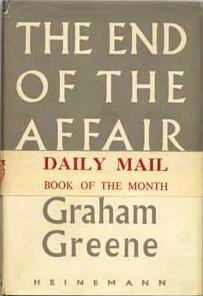 I have always been suspicious of Graham Greene’s novels. Not for any substantial or well-founded reason but because the novels seemed thin and accessible and at times I thought he might even be Arthur Miller. The central themes of the novel are expounded upon in a constant cycle of ambivalence and resolve. Sarah prays to a God she does not believe in and asks him to save the life of her Maurice Bendrix in exchange for which she would be willing to abandon him. When he lives, she feels obliged by this whispered promise, never to see him again. Maurice is friends with her husband, Henry Miller, has an affair with Henry’s wife. Henry is a successful civil servant who is totally unsuccessful in his married life which wraps around him like a veil of respectability – a veil which is all too regularly parted by his wife. Maurice is an unsuccessful novelist who profits in his personal life. Henry and Maurice’s personal circumstances are neatly aligned when the two move in together, the one a widower, the other a bachelor. Likewise, the novel’s key events occur during the bombarding of London with V1 Rockets – their sounds indistinct at first but their effect devastating and unmistakeable and this inability to interpret the signs – to navigate the physical world – is echoed by the character’s inability to navigate their emotions. The default position of the novel is ambivalence and their resolve is merely forced upon it’s characters. Constant cycles of ambivalence and resolve – constant flux – holding a mirror to the opacity of the transition of morality out of religious structure WWII Britain and the decades that followed. Greene’s novel is a short one but it is far from thin and far from accessible. Like Sarah and Maurice’s love story, my early ambiguity for Greene has been exploded into a tormenting love affair with his writing. I long always to turn this book to its beginning, and read again.